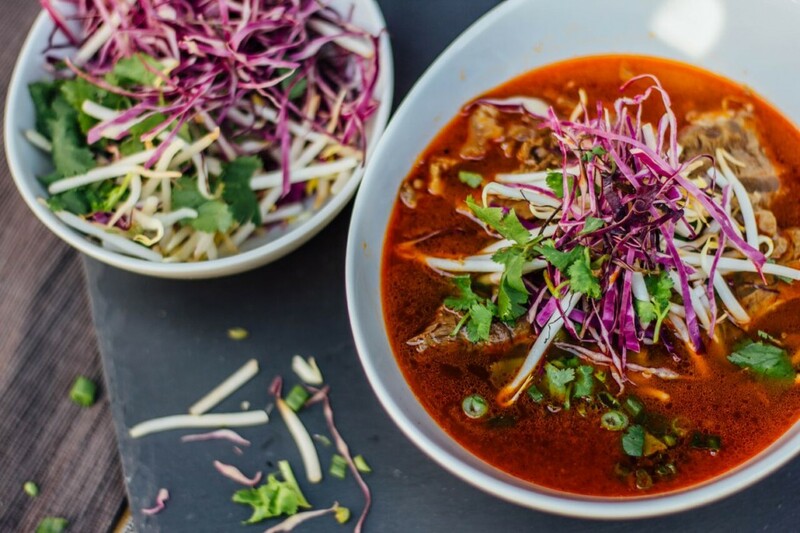 East Village is one of those neighbourhoods that has a wide sprinkling of old favourites and new pop-ups, but Madame Vo, a new eclectic Vietnamese restaurant, fits in perfectly between the two worlds. In the dark, you may miss the plain black overhang sign with white lettering, but the smell of simmered broth doesn’t let you even make it a few feet past the restaurant. My guest and I walked into a dimly lit, yet bright and modern layout, following the heavenly scent. One long, straight line of booths and marble tables run through the restaurant and the first half reveals exposed white brick and stacked mirrors while the second half is a more dark and intimate spot. A bar, sparkling with spirits, awaited us at the front along with our smiling server, who showed us to a seat in the bright half of the room. There was something very sterile and fluorescent about the restaurant, but whatever assumptions we took from decor were completely forgotten as soon as our server confidently recommended the 2015 Saveurs Pinot Noir ($11) to start the evening. The glasses were generous and the wine was well-rounded and velvety. Let’s just say it was very easy to consume quickly. Following suit, we allowed our spot-on server to recommend appetizers—Cha Gio Chay, fried spring rolls filled with vermicelli, mushrooms, taro and carrots ($8) and Goi Cuon ($9), fresh summer rolls filled with shrimp, vermicelli, lettuce, chive and basil. The fried rolls were perfectly crisped and balanced well with their accompanying sweet-spicy sauce while the spring rolls were fresh and earthy, making us wish badly that it wasn’t so cold outside. After finishing every single bite of the rolls, my guest and I perused the entrée menu, my eyes searching for the dish that was responsible for the incredible smell when we walked in. It didn’t take long for me to find it: the Madame Pho ($16), which is the restaurant’s signature dish, is a big bowl of beef broth that has been simmered for 24 hours, flat rice noodles, brisket, rare flank, bone marrow and meatballs. My guest ordered the Suon Kho ($16), which featured caramelized spare ribs braised in coconut juice. Our server assured us we ordered the two best dishes from the menu, and we weren’t surprised to find that the claim was absolutely accurate when they arrived at the table. My pho was…I’m not really sure what words to use besides exquisite. The bowl came with on-the-side mix-ins like jalapeno and sprouts, and the broth was rich and fulfilling beyond imagination. The brisket and flank were tender and the noodles perfectly cooked. I wanted badly to just pick up the bowl and gulp it down. My guest’s spare ribs were fall-off-the-bone delicate and well-seasoned atop a fluffy bed of jasmine rice, though I personally preferred my dish more. Could anyone blame me, honestly? We wanted to take the longest nap in existence after finishing every bite of our meals, and we couldn’t thank the wait-staff enough for the wonderful accommodation and incredible food. When I go back, I’ll be going back for one thing only—the pho. I suggest you hightail it to see, or slurp, for yourself, though it’s not going anywhere soon.